Whitta Takes One For The Rebellion! It’s been a while since we’ve received any major news about Star Wars Anthology: Rogue One. But it looks like the film is very much still in development. 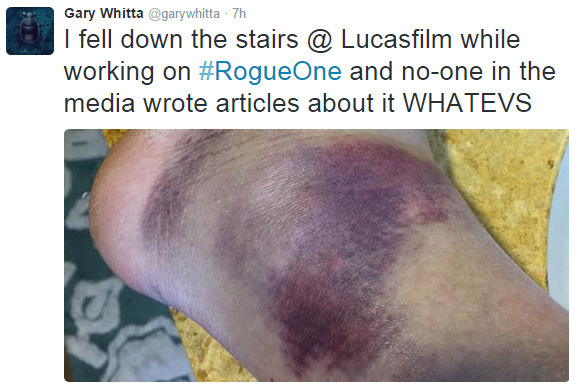 Gary Whitta, Screenwriter for Rogue One tweeted out today that he had unfortunately taken a spill on a stairway at Lucasfilm while working on Rogue One. But not to worry, fortunately, Whitta’s injury has not hindered the development of the film. To that we hope that he has a very smooth recovery and hopefully can return to his normal activities soon. Previous Previous post: Resistance Bay Set Photos! SPOILER ALERT! Next Next post: Did A Lego Product List Reveal The Name Of A New Planet?